Among the things to miss about India in a lifetime of not being there are the many ways in which fabric is embellished there. It is not only fabric that is embellished, of course. There is barely a surface that does not seem to present itself for decoration in India. 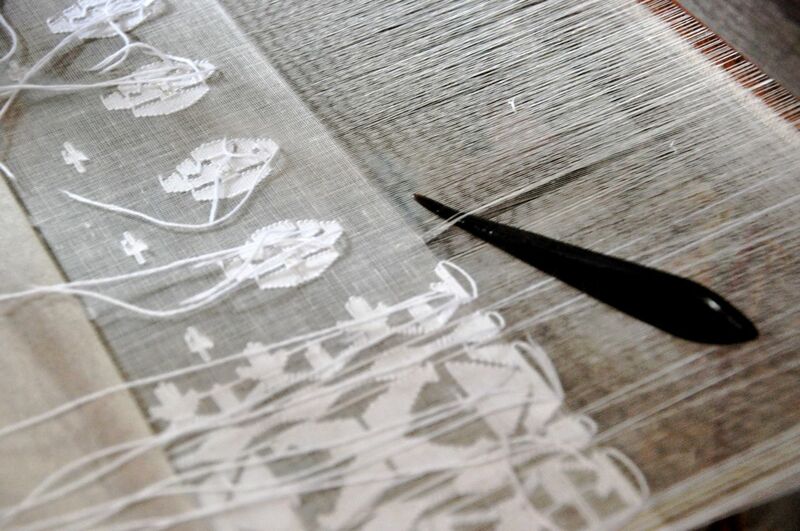 Below are a few of the techniques used to embellish and embroider fabric. Most of these labour-intensive techniques survive the introduction of mechanical means of embroidery. One of the most heartening aspects of this survival is that many of these techniques are used by people of all socio-economic groups for their own clothing and household décor; as well as for sale. is, of course, a foundational technique and in India there as many styles of weaving as there are anything else. Here is a little about two: khadi and jamdani. Mahatma Ghandi it was whose focus was to make homespun woven cloth, khadi, one of the mainstays of India’s economy. In this he may have failed but there remains a lively khadi industry and people devoted to wearing and using it and organizations who are Ghandian in that they have adopted Ghandi’s values. One such organization is the Self-Employed Women’s Association (SEWA). Established in Ahmedabad, Gujerat, as a union in the 1970s by Ela Bhatt and attached to the Textile Workers Union, co-founded by Ghandi in the 1920’s, SEWA has enabled thousands of women to earn a gainful living. It is their members who hand embroidered many of the works shown below. They sell their work in a shop called Hansiba in New Delhi and in Ahmedabad. There have been voices raised against Ghandi: that he did not get rid of the caste system; that his treatment of his nieces was selfish and unbecoming etc. For these people, the liberation of India is not enough. Ghandi in khadi. Earl Mountbatten in the togs of empire. 1940s. Ghandi, who, with his wife Kasturba, were Gujerati, established a commune in Ahmedabad on the Sabarmati river whence he launched the Salt March in March 1930. The commune has been preserved and to this day, spinning is taught. Opposite the commune is a shop piled high with the subtlest shades and patterns of khadi. When you hold up a fabric woven using jamdani (Persian for fine, figured (cotton) muslin; a specialty of Bengal) there appears to be a pattern caught in the fabric, dancing across the fabric. Inside. This effect is produced by the insertion of a secondary, non-structural weft in the form of a design. The secondary weft, usually of a heavier cotton, is introduced by hand and tied to the warp in a designated pattern, design element by design element. The results are astonishing. In a shop in Ahmedabad, 2010. The fabric shades vary each from each other by just a smidgeon. On purpose. is done using an awl with the thread held by the hand and fed from below the material which is always held taut. The resultant stitch looks like a tiny chain stitch. Vintage, very fine tambour work with applique and blanket stitch on cotton. A master embroiderer in Ahmedabad in 2010 discussed the steps of tambour work. This same transfer method is used to transfer the designs for all kinds of embroidery. The pattern is pierced onto a piece of plastic paper. A non-toxic solution is rubbed into the design lying on a piece of fabric transfers the design. The fabric is made taut in a hoop or on a frame. An awl is pierced through the fabric at every point indicated by the piercing. The thread is held below the fabric and fed to the head of the awl pierced through the cloth from above the fabric. The stitch produced is a very fine chain stitch. Embroidery styles vary by cultural and geographical areas. In both simple and compound stitches, the number of stitches used is large. This includes running, chain, square chain, reverse chain, inverted chain, stem, Romanian, knot, satin, double running, lazy daisy, herringbone, hemming, buttonhole, couching, counted thread work using tiny cross stitches. Metal thread, beads, sequins and mirrors are incorporated sometimes in the design.